...who, me? I wasn't doing anything. What do you mean, I'm even cuter than usual? ...what are you talking about? Is there something you aren't telling me? ...I'll trick you to come out. 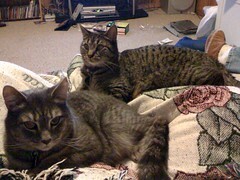 My cats, Castor and Pollux, resting in my lap. Moments later Castor attacked Pollux to claim the whole thing as his own. 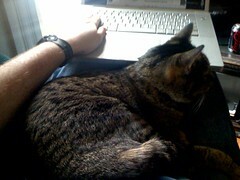 Pollux doing his job: getting in the way of mine.